I hope the next interview we see features Patty talking to Joe about her new guitar. There's a great story there - how she earned it, how she received it, and what Joe said to her throughout the process. Patty, or someone, let's write this up! Instead of seeing Patty & Joe in Cleveland tonight, I scoured the web looking for more interviews with Joe to add to the list. Found 21 new articles (my 'rule' is that they must have comments from Joe, which is why you don't see album reviews in this batch). You can see the newer entries followed by a date (Added 10/9/08). Each interview has a slightly different angle and reveals something more about Joe. Waiting for the next article about October 9, 2008 "Pattyluvsjoe Lights Up the Stage in Cleveland!" 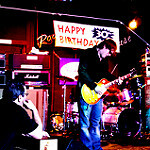 Here's a new one I came across titled "Joe Bonamassa / Never An Original Thought". The title implies it may be negative, but it's really Joe who makes the statement about himself. Lee .... Love This Quote Also .............. " I'm a pretty competitive person. If you beat me that's great, but I'll take my lumps and come back at you. 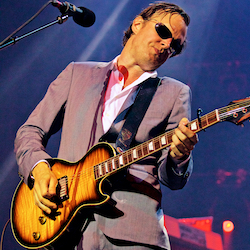 I don't really sit around and chat onstage with the other bands because I try not to lose sight of my job, which is to make fans; my mental state is always that I'm going to go onstage and I'm going to kill "
Here's another one titled "Bonamassa Goes Beyond The Blues". Even though it's dated Thursday, 16th October 2008 I'm curious when the interview took place. Hi, Jane, thanks for spotting interviews with Joe! The Reax one you found is on the list - Nov. 2007, but it was written to promote Dec. 2007 concerts. I just added the first interview of 2009, keep talking, Joe, we're reading! Can anyone scan the old Guitar Shop rig blueprint they had for Joe back in the mid 90's? I remember seeing this back then, don't remember what equipment was used though. For some reason a Big Muff sounds familiar but that isn't something I'd think would be on Joe's pedalboard. Thanks! From: Psychotic Silicon Valley, CA. I thought that I read on the forum that Joe was going to be on the cover on Guitar Player magazine soon. I found this interview on their web site. Congratulations for being voted by the Guitar Player readers as best Blues guitarist! "So much music, so little time." I was last month. Here is a link to it for those that missed it. Thanx Jim! Don't know how I missed that. I searched for it before I posted but your link has the pictures, too. Joe has a couple hundred guitars and he is still buying more? I thought his Dad owned a guitar shop. Happy Birthday, Joe! This Interview Sticky is overflowing with RAH raves, including the latest "My Jam with Eric Clapton Rocked!" Go back to the first entry to see the growing list of interviews. A great new interview by phone from Greece! Find it on the first post in this thread. Ready for a Joe Fix tomorrow at Hot August Blues festival in Maryland!